This blog will helps you to understand detailed C4C tenant architecture vs existing On premise landscapes. It also helps you to gain the detailed understanding on movements of solution profiles between C4C tenants along with creation of change project to handle support and enhancement related activities. The blog includes following cases. If customer want to opt for SAP C4C as a standalone system, the following are the points to be taken into consideration before you design your tenant architecture. After you have checked your C4C product fitment and you have decided that almost all your requirements are fulfilled by C4C out of box, then you can go with the following tenant architecture. In the above Case, It is suggested to go with two tenant architecture. When customer purchased license for Production tenant, SAP provides a Test tenant free of cost. Test tenant provided can be used until go-live. Once production is gone live, the mentioned test tenant provided by sap is decommissioned. Now, the question is how can we manage the Production for support related activities in future? For that, customers can request SAP for separate test tenant which can be a copy of existing production tenant which is charged. Newly provided test tenant can be used for support related activities. During the product fitment, customer has understood that 80-90% requirements can be fulfilled by C4C out-of-box and rest of the requirements are Custom developments can be fulfilled through SDK along with On premise systems integrations. If your On-premise landscape has Dev, Quality and Production. You can have the similar kind of set up also in C4C. C4C DEV tenant can only be used for development activities (SDK), not for business configuration activities. It means all the SDK related developments can be performed in C4C development tenant. C4C test is used for scoping, fine tuning, and integration related activities. Upon completion of Configuration related activities solution profile can be moved from C4C test tenant to C4C production. The development patch which is similar to On-premise (Workbench transport request), can be created in Dev tenant and can be moved from Dev->test->Prod. Testing can be done in test tenant after the patch has moved to Test tenant, which is eventually moved to production. Solution profile created in test tenant with scoping and fine-tuning activities, can only be moved between two tenants. In three tenant landscape it could be from Test tenant to production. If my SAP On premise landscape is more than 3 system landscape, this could be possible in some cases where some customers prefer to have preproduction. In scenarios as above, Solution profile created in test can be moved to production directly. But, how will the solution reaches Preproduction. The answer to this question is, once the solution profile reaches production, then customer request SAP through incident to copy solution profile of production to Preproduction. The solution can always be moved between two tenants only. If you have a third tenant like Preproduction/Quality like shown in figure above, we need to request SAP through C4C incident to copy the solution profile back to quality. In case of development Patches, this is slightly a different scenario, the patch created in Dev can be downloaded in Zip file and can be uploaded to test and production respectively. The best practice is only to have 3 tenant landscape. Case4: How will I move my solution profile between tenants? Scenario A: Movement of Solution profile from test to production for go -live. This is a simple scenario where the user before starting any activities of business configuration needs to create a Implementation project from business configuration facet in test tenant. Within the created implementation project, one can define his overall scope of the project and respective fine tuning activities. Based on your scoping and fine tuning, system creates activities that needs to be completed, they are not mandatory though. Once all the open activities are completed including testing related activities, a decision is made to move the solution to production. Administrator can move or transfer the solution from service control center facet ->systems-> Active systems-> Copy solution profile button ->in the Pop-up screen select Source system as your test tenant and Profile ID as the solution ID generated from implementation project. Target system is the production system that solution needs to copy. The solution is copied to production tenant, all related business configuration are copied. There are some activities those needs to be performed manually. The activities with “Repetition required” as YES are the activities that needs to carried out manually. Scenario B: Now that Project is moved to production, how will I make sure my changes in business configuration are moved to production after go-live as a part of support/enhancements? 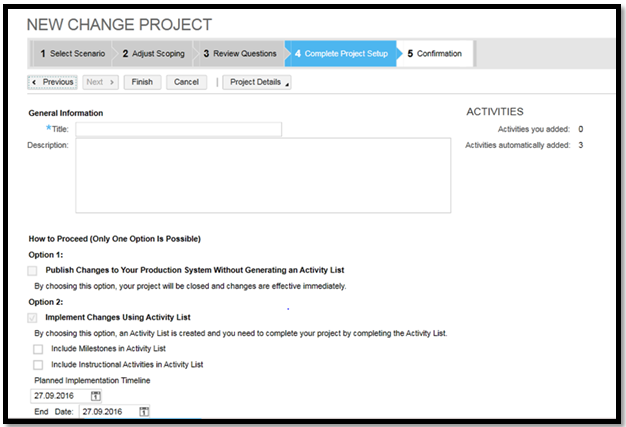 4) Complete project Setup, you can select option 1 or 2 based on the size of configuration. 5) Once the change project is created, it is important that it has to be moved to test tenant for fine tuning and testing activities. For that, source system is production and source solution ID is production solution ID created, target is test tenant. 7) Once the all the configuration related activities are completed in test, you have decided to move to production , Administrator can move or transfer the solution from service control center facet ->systems-> Active systems-> Copy solution profile button ->in the Pop-up screen select Source system as your test tenant and Profile ID as the solution ID generated from Change Request. Great blog, thanks Seshu !! When you state “The solution can always be moved between two tenants only. If you have a third tenant like Preproduction/Quality like shown in figure above, we need to request SAP through C4C incident to copy the solution profile back to quality”. What prevents one to copy a solution profile from one test tenant to another? I think this is perfectly possible. In that case I could copy the solution profile from Test into pre-prod (then complete the cutover which you don’t mention). I am still looking for a valid solution to handle a C4C 3-Tenant-Landscape connected to a SAP ERP on Premise 3-System-Landscape. Do I still have to move my changes manually from Dev to Test – except the ones which enable other ways, e.g. CAS Solutions (ZIP) and Master-/Page-layouts (ZIP/XML)? Is any Transport Management System planned for C4C? DEV system is only for development purpose, you can not do any configurations changes. As of today, I have not received any answer from SAP. As soon as have any, i would post in that blog. The blog is very helpful and informative. Can you please give an answer to the question Stefan ask?